Going on foot is an excellent choice for those who are living or working in the close proximity of Forest National. No traffic delays and no parking problems. Like cycling? The city of Brussels has set up several bike rental spots throughout the whole city. If you’d like to take a cab, try Collecto! Collecto is a share taxi service, available 7 days a week from 11 p.m. to 6 a.m. servicing the whole Brussels Capital Region. Collecto picks up passengers at more than 200 pick up spots, one of which is located at Forest National. Book your taxi at least 20 minutes in advance on +32 2 800 36 36. Want to attend an event but you’re living in Paris or Barcelona? Brussels Airlines offers super deals for flights out of almost every major city in Europe. Travelling by train and bus? 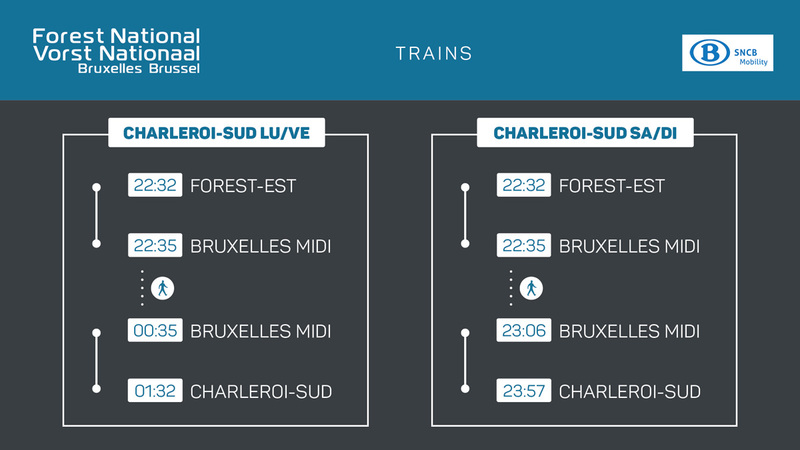 Travelling by train to Forest? 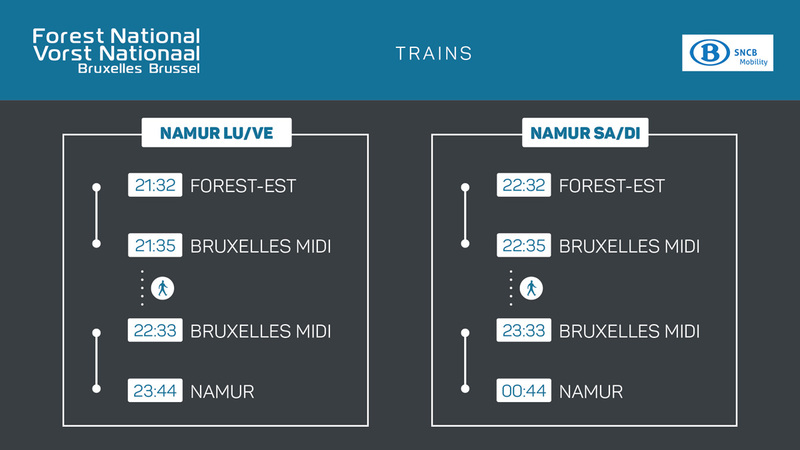 Take a train to Forest-Est/Vorst-Oost or Brussels-South (Bruxelles Midi/Brussel Zuid) and from there on Forest National is easily accessible. Forest-Est is just a 5 minute walk away from Forest National. 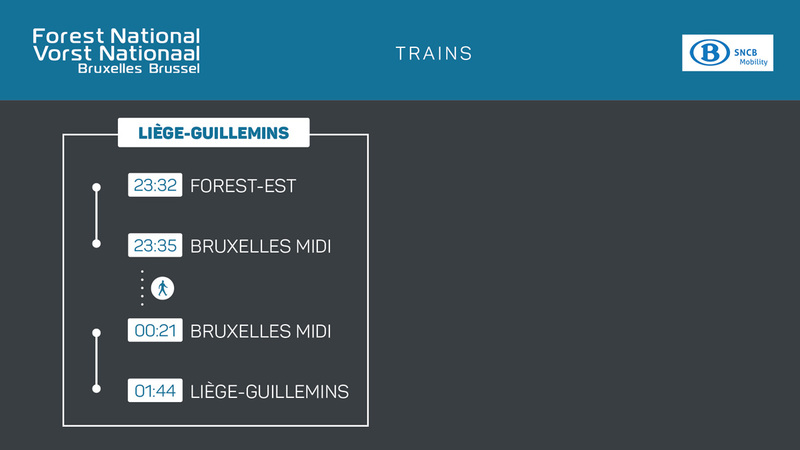 Visitors who took a train to Brussels-South can access Forest National by taking tram line 82/83 to tram stop Zaman. 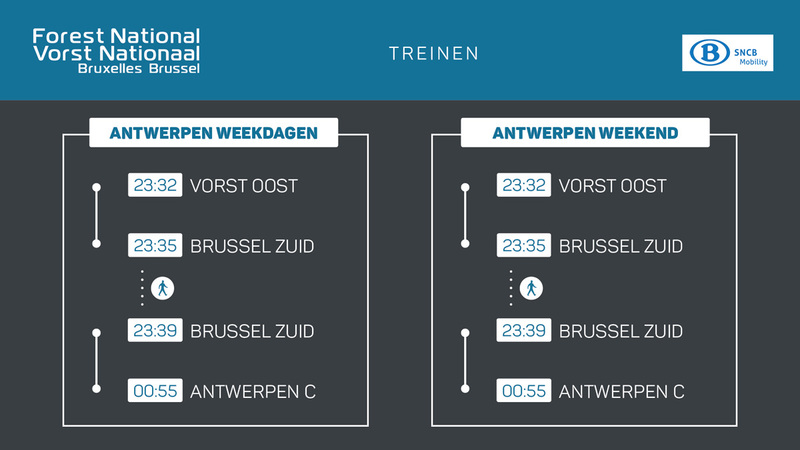 Click here for the STIB tram schedule. Since 1 January 2018 the use of the most polluting vehicles is prohibited in the Brussels LEZ, in order to improve air quality and therefore public health. The entire territory of the Brussels-Capital Region is covered by the LEZ (all 19 municipalities), although the Ring (R0) is not affected. However, certain streets allow access to particular car parks. The Stalle car park is one the 3 car parks that remain accessible. From here you can continue your commute to the venue by using public transport (Park+Ride; more info below). The Stalle car park is accessible via Rue de Stalle (between the regional border and the car park entrances/exits only), Rue du Marechal and Rue de L’Étoile (between the regional border and the car park entrances/exits only). Make your journey more comfortable: avoid the neighbourhood of Forest National, park at a Park+Ride and continue your commute to the venue by using public transport. 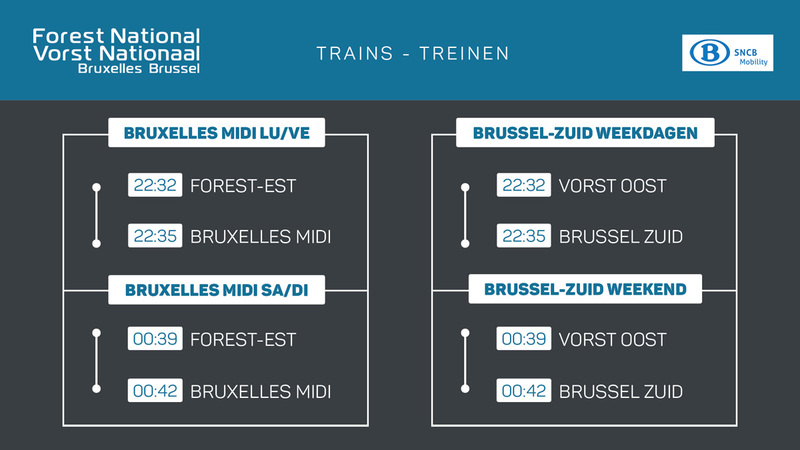 Your ticket is a valid ticket for public transport operated by STIB! The most convenient P+R is the Stalle car park, located by exit 18 – Drogenbos of the R0 ring road surrounding Brussels. From here on you will be able to take several trams at tram stop Keyenbempt. Lines 82 and 32 all run between here and tram stop Zaman – Forest National. 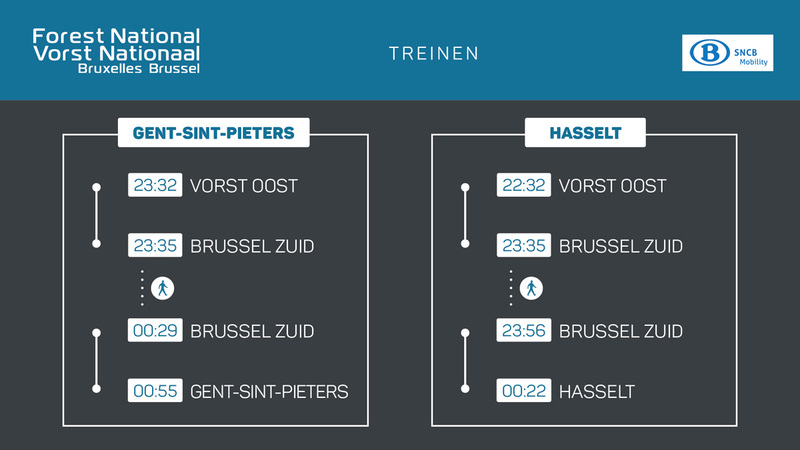 We work together with the STIB to provide extra trams if needed. Forest National organizes a K+R zone for concerts attracting younger visitors. Make use of our DROP OFF ZONE where cars can discharge passengers at avenue du Globe/Globelaan 72-76, 1190 Forest (maximum 10 minutes parking!). A 5 minutes walk along the avenue du Globe/Globelaan, which is garded by the police, brings the visitors from the Drop Off Zone to the venue. Car drivers can then park their car in the AUDI car park tower situated at the corner of Boulevard de la Deuxième Armée Britannique and Rue des Abbesses, 1190 Forest. A parking ticket is 5 euros. Youngsters can be picked up on the esplanade in front of the venue at the moment when the event finishes (ending times are announced some days beforehand on the page of the event). From Forest National to the AUDI car park tower it takes only 10 minutes on foot. Do you need a ride to Forest National? Are you driving and still got a spare seat in your car? Try carpooling! Carpooling is economical and pleasant! And on top of that it is also green and helps reducing traffic in the capital of Brussels. That’s why we like to support Eventpool! Sign up now, on www.eventpool.be and look for the event you are attending. Then post your travel route and find a travel companion! Check out www.europcar.be for more information.